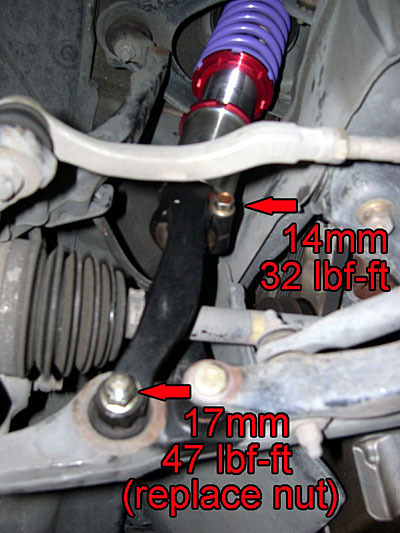 Many people quickly find that their stock suspension components are geared more towards comfort than performance, and many shops charge way too much to swap these components out for you. However, it really is quite simple to do yourself...so this tech article will show you how to replace your springs and shocks with something geared more towards performance. 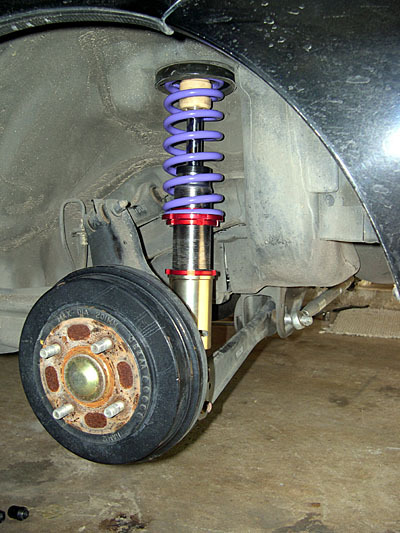 There are numerous combinations of springs and shocks out there, so this article will simply focus on showing you how to do the installation...we will leave the actual choice of suspension components up to you. 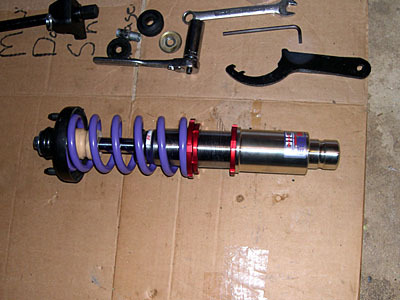 The setup we will be installing in this write up is the non-damper adjustable FLT-1US full coilover system by JIC Magic. This system will allow for height adjustment seperate from the spring perch...allowing us to keep full suspension travel no matter how low we go. Installation is very straight forward, so I give this a difficulty of three on a scale from 1 to 10. 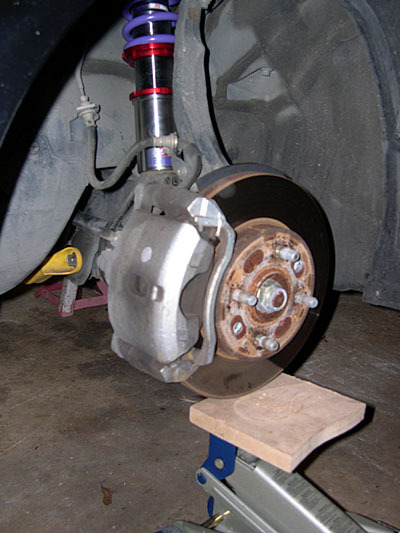 Before you start, you need to raise the vehicle and support it on jack stands. You should never work under a car supported by only a jack. You	should also disconnect the negative battery terminal. 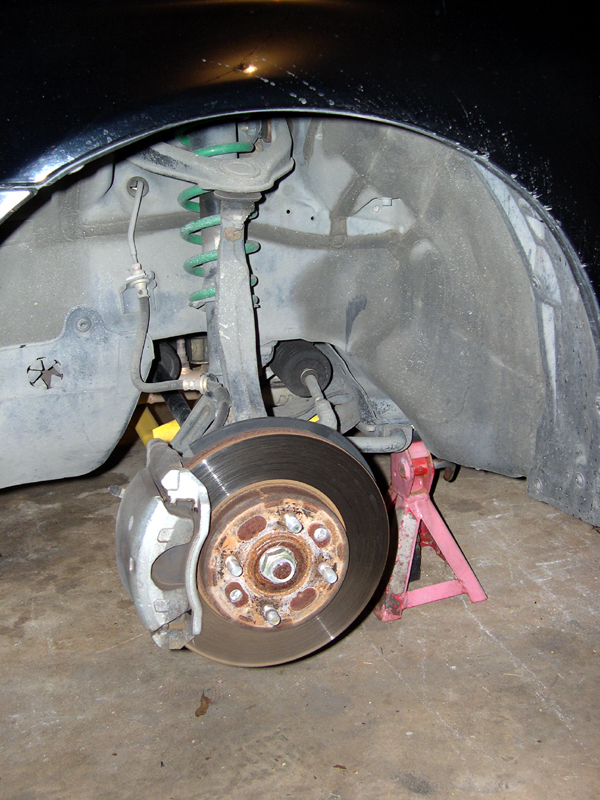 Before you get started you will need to loosen the lugnuts on both front wheels, then raise car and support it with jack stands, and finally...remove the front wheels. Now you need to remove the 14mm pinch bolt from the top of the damper fork. Finally, remove the two 14mm top flange nuts, and then remove the damper assembly from the car. You can see that I had Tein springs and stock shocks...they will both be replaced by the shiny new JIC units. If your dampers did not come with new upper mounts, you will need to disassemble the stock dampers and use the stock upper mounts. To get the damper apart, you first need to use your spring compressors and relieve the pressure on the dampers. Next, remove the 14mm nut on top of the damper while using a 5mm allen wrench to keep shaft from turning. Now remove the upper mount, all the pieces, and the spring. You will need to salvage any parts you need for your installation. I needed the upper mount, one of the rubber pieces, and the spring mounting rubber. 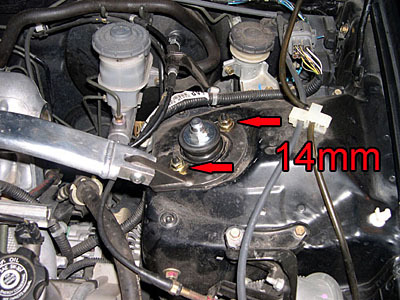 (which is still inside the upper mount) Also carefully remove the spring compressors and set the spring aside. Next you will assemble your new damper via the instructions for your specific application, and use the salvaged pieces if needed. Repeat all steps for other side. Now simply reverse the steps for installation. You might need to use the jack to raise up the control arm a bit to get the new damper in. Reinstall the wheels and hand tighten lug nuts. 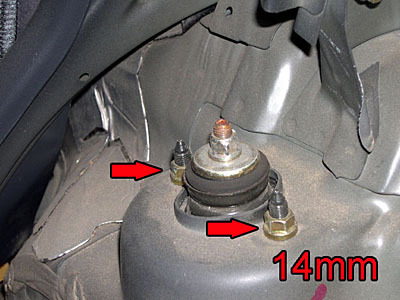 Before you get started you will need to loosen the lugnuts on both rear wheels, then raise car and support it with jack stands, and finally...remove the rear wheels. 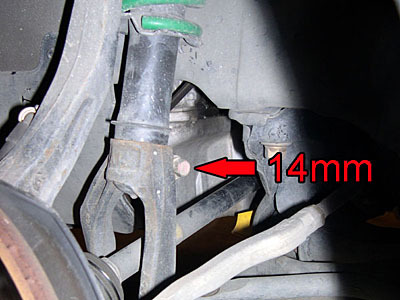 Now you need to remove the 14mm flange nuts on top of the dampers in the trunk/hatch. Next you will remove the lower 14mm flange bolt from the damper, and the 14mm flange bolt holding the LCA to the trailing arm. Now lower the LCA and remove the damper assembly. If your dampers did not come with new upper mounts, you will need to disasemble the stock dampers and use the stock upper mounts. Make sure you use your spring compressors to remove the load on the shock, then remove the 14mm nut on top of the damper while using an allen wrench to keep shaft from turning. (same as on front) Now remove the upper mount, all the pieces, and the spring. You will need to salvage any parts you need for your installation. I needed the upper mount, one of the rubber pieces, and the spring mounting rubber. 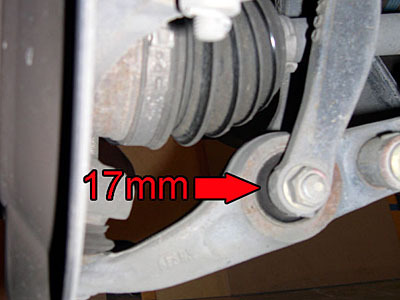 (which is still inside the upper mount) Also carefully remove the spring compressors and set the spring aside. Repeat all steps for the other side. Now simply reverse the steps for installation. The rear is now installed. Now you need a 4 wheel alignment and you will be set. 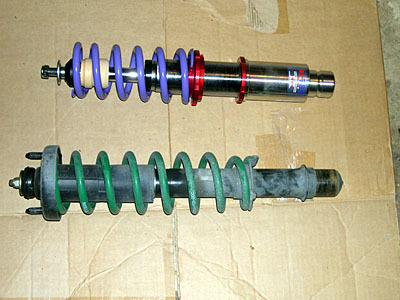 [b]6th Gen (6G) Honda Civic Coilover Damper Install[/b] Article By [url=http://georgebelton.com]George Belton[/url] Many people quickly find that their stock suspension components are geared more towards comfort than performance, and many shops charge way too much to swap these components out for you. 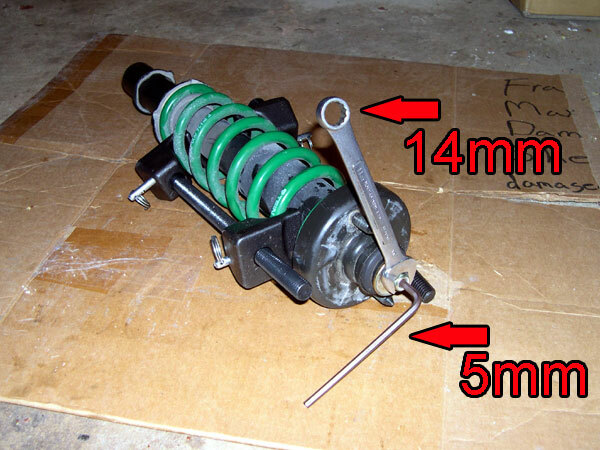 However, it really is quite simple to do yourself...so this tech article will show you how to replace your springs and shocks with something geared more towards performance. 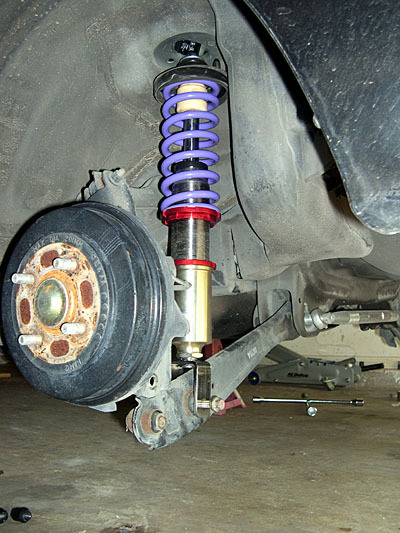 There are numerous combinations of springs and shocks out there, so this article will simply focus on showing you how to do the installation...we will leave the actual choice of suspension components up to you. The setup we will be installing in this write up is the non-damper adjustable FLT-1US full coilover system by [url=http://www.jic-magic.com]JIC Magic[/url]. This system will allow for height adjustment seperate from the spring perch...allowing us to keep full suspension travel no matter how low we go. Installation is very straight forward, so I give this a difficulty of three on a scale from 1 to 10. 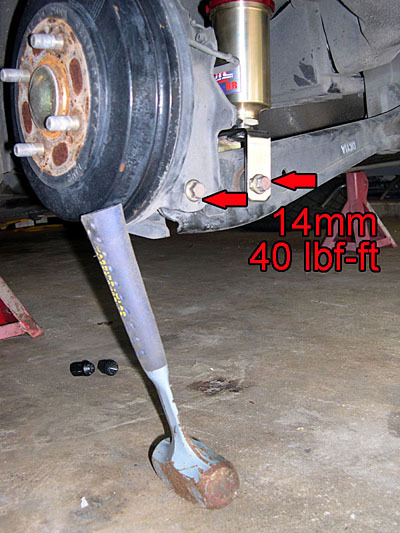 Items to gather before you start: - jack and jack stands - blocks for front wheels - spring compressors (highly reccomended for safety) - lug wrench - torque wrench - (2) ratchets - (1) regular and (1) deep 14mm socket - (2) regular and (2) deep 17mm sockets - (1) regular 19mm socket (for most spring compressors - breaker bar and liquid wrench (optional) - 5mm hex wrench - (2) replacement locking nuts for front fork bolts - any other tools required by your new dampers Before you start, you need to raise the vehicle and support it on jack stands. You should never work under a car supported by only a jack. You	should also disconnect the negative battery terminal. 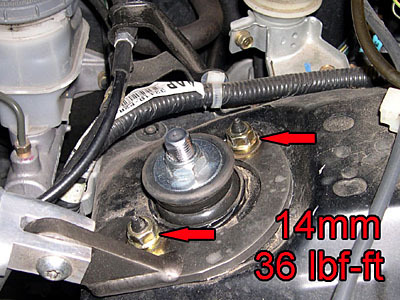 [b]Front Dampers[/b] Before you get started you will need to loosen the lugnuts on both front wheels, then raise car and support it with jack stands, and finally...remove the front wheels. [img]http://georgebelton.com/6g.civic.tech/dampers/front_01.th.jpg[/img] Now you need to remove the 14mm pinch bolt from the top of the damper fork. [img]http://georgebelton.com/6g.civic.tech/dampers/front_02.th.jpg[/img] Then remove the 17mm nut and bolt holding the fork to the lower arm, and remove the fork. (you might need a breaker bar here) [img]http://georgebelton.com/6g.civic.tech/dampers/front_03.th.jpg[/img] Finally, remove the two 14mm top flange nuts, and then remove the damper assembly from the car. [img]http://georgebelton.com/6g.civic.tech/dampers/front_04.th.jpg[/img] You can see that I had Tein springs and stock shocks...they will both be replaced by the shiney new JIC units. [img]http://georgebelton.com/6g.civic.tech/dampers/front_05.th.jpg[/img] If your dampers did not come with new upper mounts, you will need to disasemble the stock dampers and use the stock upper mounts. 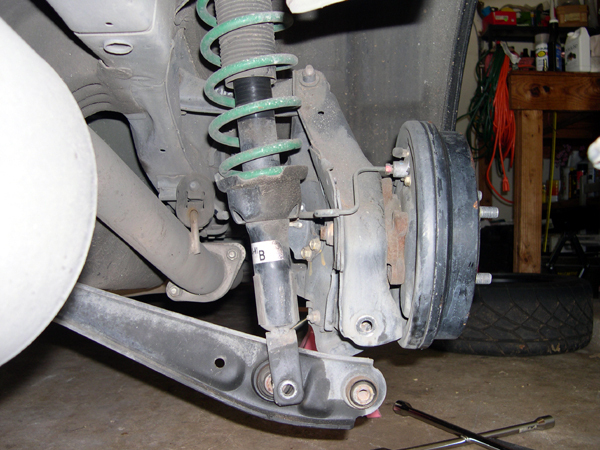 To get the damper apart, you first need to use your spring compressors and relieve the pressure on the dampers. Next, remove the 14mm nut on top of the damper while using a 5mm allen wrench to keep shaft from turning. [img]http://georgebelton.com/6g.civic.tech/dampers/front_06.th.jpg[/img] Now remove the upper mount, all the pieces, and the spring. You will need to salvage any parts you need for your installation. I needed the upper mount, one of the rubber pieces, and the spring mounting rubber. 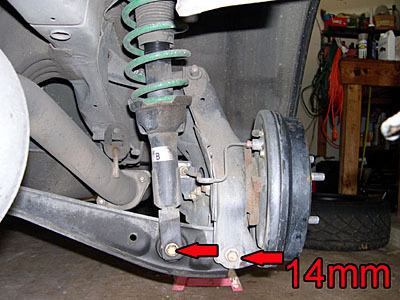 (which is still inside the upper mount) Also carefully remove the spring compressors and set the spring aside. [img]http://georgebelton.com/6g.civic.tech/dampers/front_07.th.jpg[/img] Next you will assemble your new damper via the instructions for your specific application, and use the salvaged pieces if needed. [img]http://georgebelton.com/6g.civic.tech/dampers/front_08.th.jpg[/img] Repeat all steps for other side. Now simply reverse the steps for installation. You might need to use the jack to raise up the control arm a bit to get the new damper in. 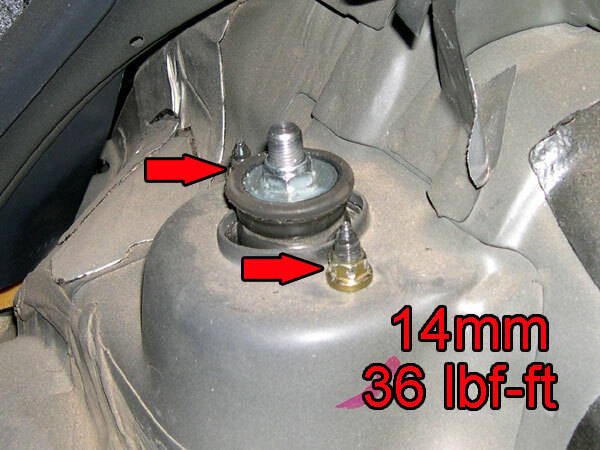 [img]http://georgebelton.com/6g.civic.tech/dampers/front_09.th.jpg[/img] After you have the bolts back in, you will need to torque the pinch bolt to 32 lbf-ft and the lower nut to 47 lbf-ft (Helms recomends to replace this nut, they cost me a buck each at the dealer) [img]http://georgebelton.com/6g.civic.tech/dampers/front_10.th.jpg[/img] Now torque the upper flange nuts to 36 lbf-ft [img]http://georgebelton.com/6g.civic.tech/dampers/front_11.th.jpg[/img] Reinstall the wheels and hand tighten lug nuts. [img]http://georgebelton.com/6g.civic.tech/dampers/front_12.th.jpg[/img] [b]Rear Dampers[/b] Before you get started you will need to loosen the lugnuts on both rear wheels, then raise car and support it with jack stands, and finally...remove the rear wheels. Now you need to remove the 14mm flange nuts on top of the dampers in the trunk/hatch. [img]http://georgebelton.com/6g.civic.tech/dampers/rear_01.th.jpg[/img] Next you will remove the lower 14mm flange bolt from the damper, and the 14mm flange bolt holding the LCA to the trailing arm. [img]http://georgebelton.com/6g.civic.tech/dampers/rear_02.th.jpg[/img] Now lower the LCA and remove the damper assembly. [img]http://georgebelton.com/6g.civic.tech/dampers/rear_03.th.jpg[/img] If your dampers did not come with new upper mounts, you will need to disasemble the stock dampers and use the stock upper mounts. 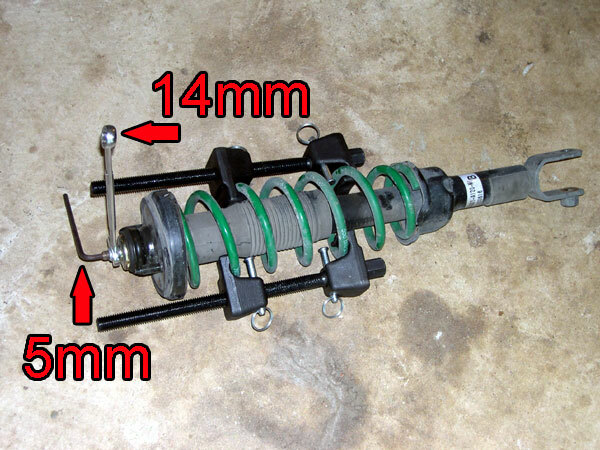 Make sure you use your spring compressors to remove the load on the shock, then remove the 14mm nut on top of the damper while using an allen wrench to keep shaft from turning. [img]http://georgebelton.com/6g.civic.tech/dampers/rear_04.th.jpg[/img] (same as on front) Now remove the upper mount, all the pieces, and the spring. You will need to salvage any parts you need for your installation. I needed the upper mount, one of the rubber pieces, and the spring mounting rubber. 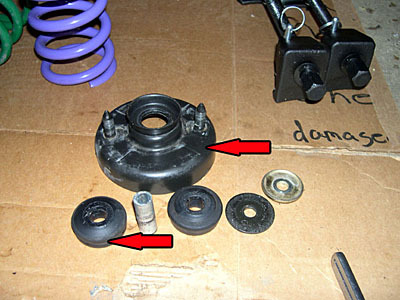 (which is still inside the upper mount) Also carefully remove the spring compressors and set the spring aside. Repeat all steps for the other side. Now simply reverse the steps for installation. First get the damper in place [img]http://georgebelton.com/6g.civic.tech/dampers/rear_05.th.jpg[/img] Once all the bolts are in finger tight, you will need to torque both lower flange bolts to 40 lbf-ft [img]http://georgebelton.com/6g.civic.tech/dampers/rear_06.th.jpg[/img] Then torque the upper flange nuts to 36 lbf-ft [img]http://georgebelton.com/6g.civic.tech/dampers/rear_07.th.jpg[/img] The rear is now installed. [img]http://georgebelton.com/6g.civic.tech/dampers/rear_08.th.jpg[/img] Finally, reinstall the wheels and hand tighten the lug nuts, then lower the car off of the stands. If your new dampers are height adjustable then you may need to raise it up and down a few times to get it the right height and even on both sides. When you are done, tighten all your lugs to 80 lbf-ft. Now you need a 4 wheel alignment and you will be set. You can find the full article with links to larger images [url=http://www.georgebelton.com/6g.civic.tech/dampers/index.php]HERE[/url].